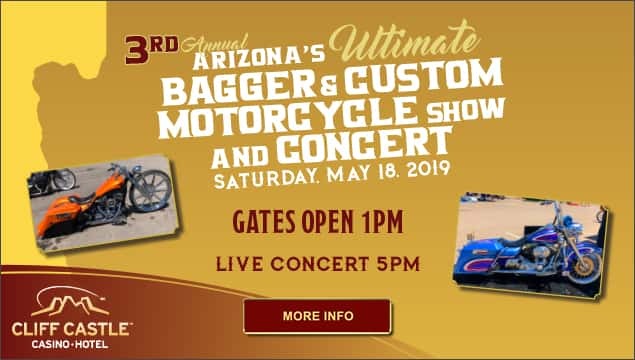 Cliff Castle Casino Hotel is happy to host Arizona’s 3rd Annual Ultimate Bagger and Custom Motorcycle Show! We’re featuring Baggers, Choppers, Low Riders, Trikes and other styles of creatively customized motorcycles. We’re giving out awards in over 14 classes, and more than $5,400 in cash and prizes. Gates open at 1pm. Bring the whole family! Tickets are $35 for adults, $15 for youth 13-17, and kids 12 and under are admitted FREE! Along with the amazing collection of boss bikes, there will be a concert featuring Atlanta Rhythm Section along with the Born to be Wild Tour, and, all the way from L.A., YouTube Sensation Brittany Flores! Your Master of Ceremonies for this concert is none other than Beer Run Bobby. Don’t miss this tremendous day of great motorcycles and music! Info & Tickets CLICK HERE! !